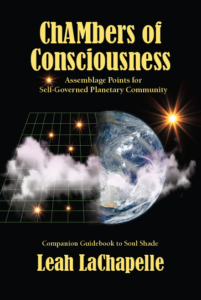 Soul Shade is a groundbreaking evolutionary bounce….. for the cleaving edge of Humanity. How do We separate from the planetary system which imprisons Us, and at the same time, become One with those who perpetuate it? The invitation of all invitations, coursing unwaveringly throughout the Ages, is for Humanity to choose to evolve beyond Our hostile and divisive phase, into an era of peace, abundance, and respect for all. Where is this invitation coming from and can We reply to it in time? “Soul Shade” offers Us how to connect with Our Souls, so that more Humans can intentionally respond to this monolithic invitation, in accordance with the natural evolutionary design. As the end of this Age surges into view toward a climax that, without the necessary proportion of responses, could possibly mean that the invitation to Humankind would be withdrawn altogether. The number of Soul connections must increase in order to fulfill the divine quotient. This invitation is extended on a Soul-level, to any and all who have asked for the ability to liberate Earth inhabitants, and Nature herSelf from the confines and limitations of a harshly controlled, self-serving reality. Accompany Aaron Boden on his evolutionary path that takes him all the way to the very end of this present Age. Authenticating multi-dimensionality, as an extension of one’s Soul, is the DNA recalibration that Aaron and others find themselves embodying. Aaron and those his Soul touches, will take you on an experiential journey, as he learns what he can and cannot trust, for transitioning out of this old hierarchical Age, envisioning real freedom for Humanity, and transcending the agenda that relentlessly works to prevent the birth of a new paradigm. Getting a good look at the reality behind the veil of secret black operations and dark pinnacles within hierarchical layers is an added plus for navigating in these current times. 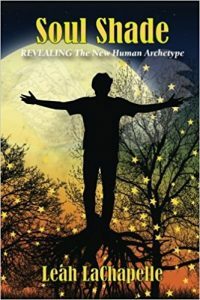 Readers may find themselves using this fictional story by writer teacher Leah LaChapelle, as a playbook for their own part they play in the future of Our species and planet, for becoming recognizable in the Great REVEALING of the new Human archetype. With a story line piquancy reminiscent of The Celestine Prophecy, SOUL SHADE integrates artificial intelligence, romance, intrigue, spiritual portal openings of Self-empowerment, and galactic and personal destiny. Buy it at Amazon. Or buy a signed copy from Leah.